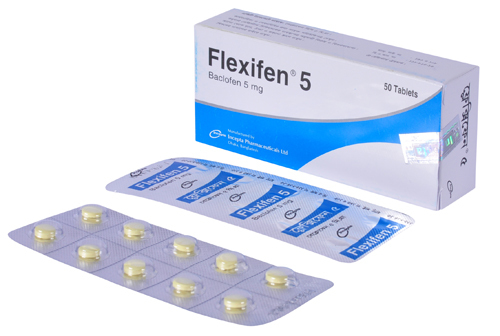 Flexifen 5: Each tablet contains Baclofen BP 5 mg.
Flexifen 10: Each tablet contains Baclofen BP 10 mg.
Baclofen is a centrally acting skeletal muscle relaxant and an antispastic agent with a spinal site of action. - Cerebrovascular accidents or neoplastic or degenerative brain disease. - Muscle spasm of cerebral origin especially infantile cerebral palsy. 25 mg 3 times daily for 3 days. Thereafter, additional increases may be necessary. The optimum dosage generally ranges from 30 - 80 mg daily in 3 - 4 divided doses. Daily doses of 100 - 120 mg may be given to carefully supervised patients in hospitals. Treatment should be started at a very low dose, e.g., 0.3 mg/kg per day in divided (preferably 4) doses. The dosage should be raised cautiously at 1-2 week intervals until it is sufficient for the child\'s individual needs. The usual dosage range for maintenance therapy is 0.75 to 2 mg/kg body weight per day. In children aged over 10 years a maximum daily dose of 2.5 mg/kg body weight may be given. Baclofen is excreted principally in urine as unchanged drug. So it may be necessary to reduce the dosage in patients with impaired renal function. The most common side effects include drowsiness, nausea, dizziness, lassitude, lightheadedness, confusion, fatigue, muscular pain & weakness and hypotension. Patients suffering from psychotic disorders, schizophrenia, depressive or manic disorders, confusional states or Parkinson\'s disease, should be treated cautiously with Baclofen. 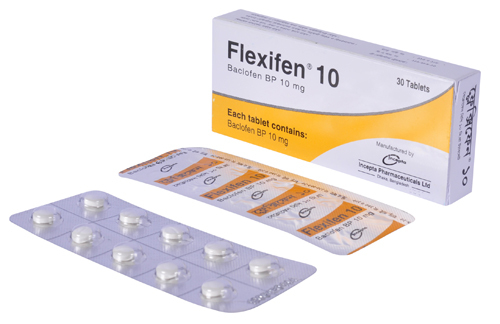 Baclofen stimulates gastric acid secretion and should be used with caution in patients with a history of peptic ulcer and avoided in those with active peptic ulcer disease . Liver function should be monitored in patients with liver disease; patients with renal impairment need a reduced dose. Baclofen should be used with caution in patients with respiratory impairment. Observations of increased blood sugar concentrations suggest caution in patients with diabetes mellitus. Care is also required in the elderly, in whom adverse effects may be more common, and in patients with cerebrovascular disease (who tolerate Baclofen poorly). Baclofen may cause drowsiness; patients affected should not drive or operate machinery. Abrupt withdrawal of Baclofen may result in a withdrawal syndrome and exacerbation of spasticity; dosage should be reduced gradually over at least 1 to 2 weeks, or longer if symptoms occur. There are no adequate and well controlled studies of Baclofen in pregnant women. So it should be used during pregnancy only if the potential benefit outweighs the potential risk to the fetus. Baclofen is excreted in breast milk. However, evidence suggests that the quantities are so small that no undesirable effect on the infant would be expected.